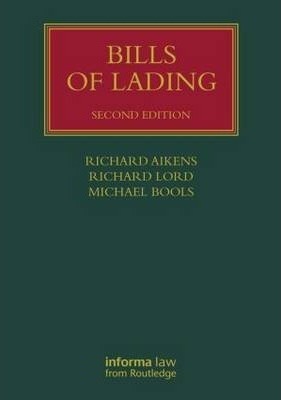 Bills of Lading form an essential part of the carriage of goods by sea and international trade. Their multi-functional nature, together with the large volume of case law and regulation, make the law in this field as complex is it is commercially vital. This bestselling book provides a detailed analysis of the law and practice applicable to bills of lading before, during and after shipment, helping today's busy practitioner to quickly and easily find the information they need. This text continues to provide an indispensable reference for maritime practitioners and institutions worldwide. Richard Aikens was a Lord Justice of Appeal from 2008 to 2015. He now works as an arbitrator. Richard Lord is a Barrister at Brick Court Chambers, UK. Michael Bools is a Barrister at Brick Court Chambers, UK.